Chris Mooney-Singh THE BEARDED CHAMELEON Black Pepper Books (Melbourne), red wheelbarrow books (Singapore). There is little wonder that there is a sense of ‘otherness’ running through Chris Mooney-Singh’s second major collection The Bearded Chameleon. As in his first collection, The Laughing Buddha Cab Company, Mooney-Singh is very aware that it is impossible not to stand out in either India or Australia when you are a turbaned, bearded westerner. 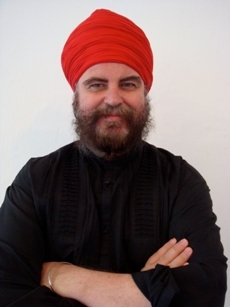 Having converted to Sikhism in 1989 his poems reflect an inspiration which is perhaps unique to Australian poetry. on fallow field like any other farmer. directly below these apartment blocks. The strength of this poem lies in its almost spiritual sense of temptation. From a western tradition one thinks immediately of Satan’s role in tempting ‘virtuous men’. In the same way in this poem Mooney-Singh is escaping the temptation to cut himself off from the reality of his adopted land by retreating into an Indian version of the West. One of the surprising strengths of this poem, at least for me, was the poet’s use of rhyming couplets. While initially a little wary of the use of the form through a fairly long poem, Mooney-Singh manages to pull it off with remarkable skill – for the most part the poem maintains a strong internal rhythm mostly avoiding any forced rhymes that could disrupt the flow of the poem. The other strength of this collection is the way that Mooney-Singh can turn the everyday into poetry. From the stark contrast of the imagery in a poem like ‘Indian City’ – “satellite dishes on a temple sky-line” and “fresh cow pats on the new overpass” – to the wonderful juxtaposition of the astrologer in ‘The Thirteenth House’ with the Stock Broker in ‘Mr Chopra’ , we begin to sense that the poet has, perhaps almost a unique insight into the day to day functioning of Indian life. In the final instance the contradiction of an Australian trying to blend, like a chameleon, into the everyday of Indian life provides the major strength of this collection. Mooney-Singh has become very close to India, but he still brings the cultural baggage of the West with him. Like the Chameleon, no matter how still he stands, no matter how much he tries to blend in, we can still see the outline of a previous life if we look closely. There is much to enjoy in this book and I look forward to Mooney-Singh’s next collection. This entry was posted in Chris Mooney-Singh, Issue 1, Mark Roberts, The Bearded Chameleon and tagged australian poets, Chris Mooney-Singh, The Bearded Chameleon, The Laughing Buddha Cab Company by Mark Roberts. Bookmark the permalink.